Change takes time, my friend, especially in our fair city. Any one of the myriad candidates will struggle to make any huge turnarounds in six months, some more than others. I don't think even the mighty Dave Bing can do much in such a short time. But hey, everyone's entitled to their own opinion. First, I have to say that I love the handle "Captain Tomorrow". Second, and more to the point of your comment, I agree with you completely that change will take time - especially in Detroit and especially within the context of our current economy. No one in their right mind would expect our Interim Mayor Ken Cockrel, or anyone else, to make huge turnaround within a six month time frame. In fact, it's precisely because this change will take so long that I am profoundly disappointed in Mr. Cockrel. Since it will unquestionably take several years to bring about this transformation, we simply cannot afford to wait to get start. We have to start the process now or we will never get there. And what has Ken Cockrel offered to start the process of bringing about Detroit's transformation? Purely token gestures, such as the police mini-stations. In contemplating the importance of a mini-station, please consider this: officers within the Northwestern District tell me that they are seeing 30 - 40 calls to 9-1-1 that go unanswered on almost every shift. This is more calls for service than most police departments - entire departments; representing entire cities - have drop off the board in an entire year. Really. How many 9-1-1 calls will a mini-station respond to? In order to bring its performance up to par, the Detroit Police Department will need to hire a lot more police officers and shift many certified officers away from non-police duties such as manning a desk. We will also need to provide those officers with better training, better pay and better infrastructure and to hold them accountable for what they do on the job. A mini-station doesn't do any of these things. It simply depletes resources that could be used elsewhere much more effectively. In a perfect world, I would love to have dozens of mini-stations across the city to supplement the larger stations. However, that's something that we can focus on once DPD's response times are at least close to par with national averages. In addition, Mr. Cockrel hasn't done a lot of other things that will need to be done in our city. He hasn't completed the audit that's now almost a year overdue. He hasn't made any effort to consolidate the City of Detroit's bureaucracy. 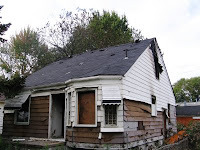 He hasn't made any progress in dealing with vacant and foreclosed homes. This is important since the Warrendale neighborhood is essentially the epicenter of mortgage crisis in metro Detroit. The U.S. Conference of Mayors collected the Best Practices of various cities across the nation to give other mayors guidance in how to respond to these challenges. However, none of that experience has been put to use in Detroit. Of course, I don't expect Mr. Cockrel to solve all of Detroit's problems in only 6 months. But I do expect him to get the process started.